An original 1887 painting was discovered several years ago when a few of the Pabst Brewery buildings began restoration. 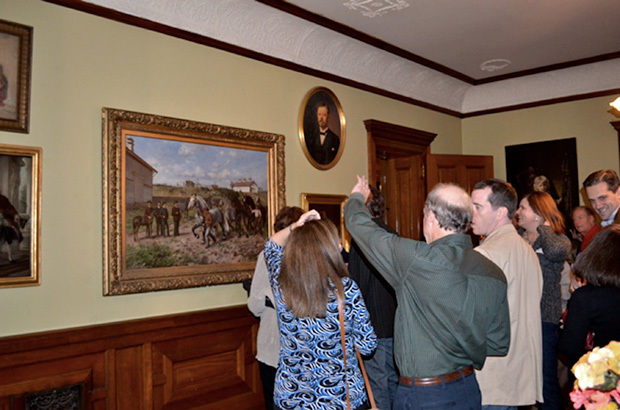 The painting was acquired by the Pabst Mansion Foundation and has been cleaned, repaired and hung in the second story foyer of the Mansion. Below is a photo of the unveiling at a Home and Garden party held at the Mansion two years ago. We are pleased to report that the WHHPC has received reproduction rights from the Pabst Mansion. The original painting is about 3’x5’, but smaller versions (20” x 28”) are available in both a Giclee canvas suitable for framing and a mounted frameless version with a cleat for hanging (photo of hanging frameless version below). These are available through the WHHPC for $250 each. Bresler-Eitel Framing is offering a 25% discount for neighbors on custom framing of the canvas version. A further description of the painting is below. In 1885, Captain and Mrs. Pabst purchased approximately 200 acres of land in Wauwatosa, a village just west of Milwaukee. It was on this property Captain Pabst formed a large stock farm to raise Percheron horses to be used for hauling wagons at the brewing company. A successful stud operation continued for years under the direction of Captain Pabst, and horse breeding became a favorite pastime for him. On a hill above the stock farm was a wood house where the family retreated during the hot summer months. 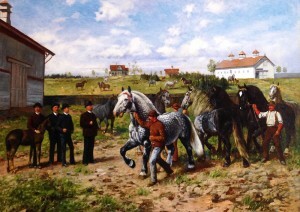 All of these images are captured in the painting ‘Captain Pabst at the Stock Farm’, commissioned by Captain Pabst in 1887. The painting, done by a local artist, shows Captain Pabst, his two sons Gustave and Frederick, Jr., along with the farm foreman examining some of the horses, the most prominent at front is his award winning horse named Burg. Completed five years before the Pabst Mansion, this painting originally hung in the offices of the Pabst Brewing Company.